A 50-70-pound service pig and owner were booted from a U.S. Airways flight originating from Bradley International Airport near Hartford CT and headed to Washington D.C. on Friday, CBS 3 in Springfield, MA reported. University of Massachusetts-Amherst professor Jonathan Skolnik was unfortunately seated next the hog, and thought it was a duffel bag at first. “But it turns out it wasn’t a duffel bag. We could [smell] it and it was a pig on a leash,” he commented to ABC News. "I was terrified, because I was thinking I'm gonna be on the plane with the pig," he added. This was before the emotional-support animal began squealing, then proceeded to defecate in the aisle. 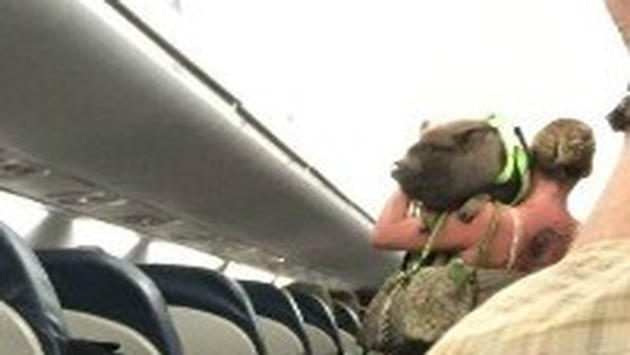 Parent company American Airlines said the pig was allowed on the flight because it was an official service animal. But flight attendants had to step in after the disruption, and the pair exited the aircraft without incident before takeoff.